Bathroom Shower Curtains & Unique Shower Curtain Sets | Collections Etc. 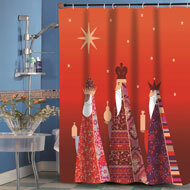 There’s no better way to bring big personality to the bathroom than with unique shower curtains from Collections Etc. We take great care to ensure that we offer special, stylish designs that are easy to integrate into your bathroom décor, and you won’t find many of these bath curtains elsewhere! Peruse our massive assortment for affordable styles that provide personality, privacy and practicality in the washroom. Get inspired with a wide variety of rustic, whimsical, nature-inspired, seasonal and country shower curtains from our trove. Whether you’re looking for butterfly shower curtains for your spring-themed bathroom or simply need a high-quality, solid-colored bathroom shower curtain set that matches your specific color scheme, we’re confident you’ll find it here in our huge variety. Featuring all sorts of special designs — butterflies surrounded by garland, Americana motifs with red hearts and stars, scenic forest images in splashes of fall hues — these bathroom curtains are bright, inviting and sweet enough to design the entire bathroom around. It doesn’t matter if you dream of a coastal style for your beach house or a country shower curtain for the lodge, our variety will get your design wheels spinning. 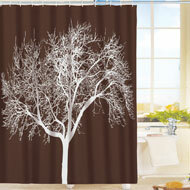 Not only are our shower curtains stylish, they’re also practical. Each one is made of a high-quality, water-resistant polyester or vinyl material that keeps it in great shape even when it’s constantly exposed to moisture. 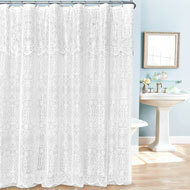 Some of these shower curtains are sold as a set complete with shower hooks and rings. 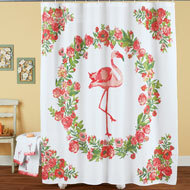 For more fantastic bathroom décor, be sure to shop our entire bathroom department at Collections Etc. !